of 1 1/2" flat stock to each side for a place to store my grinders. and the new MM211 took most of my money. That's a good idea. I'm always spending more time looking for something than welding. Maybe I should go to HF! Are they on sale? Good idea for the grinders, too. OH BOY, Yes it is on sale, I just cant remember for sure when it stops. I want to say the 28th. But please dont hold me to that date. Well I simply love this thing! I think I was the worlds worst about laying things down and covering them with something. Now I can roll this cart to the door if I am outside or I can leave it sit where it is if I am indoors. I am still trying to get used to it, having everything right there. I got lucky since when I found it at HF and it was out of stock, they said a few were on the truck coming the next day. I went the next afternoon fully expecting to hear one of to responses. 1 Being It wasn't on the truck. 2 Being its all the way to the front and we wont get it till tomorrow. Lucky me heard them say we have 2 unloaded, would you like one. HF said they dont last long, so if you want one at the sale price then maybe try to get a rain check just in case. Well its been a few days since I got it filled up. The bad news was not a surprise !!! There just was not enough room. 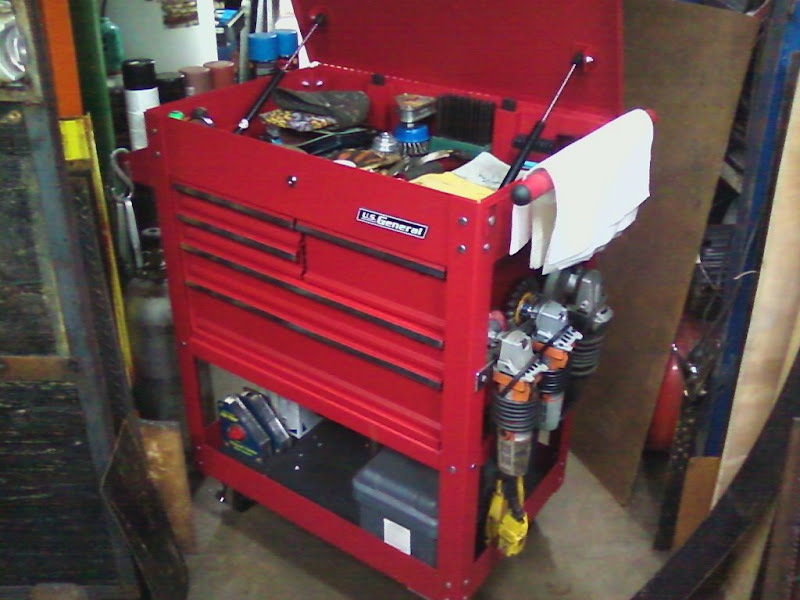 But I think that goes with any type tool box. 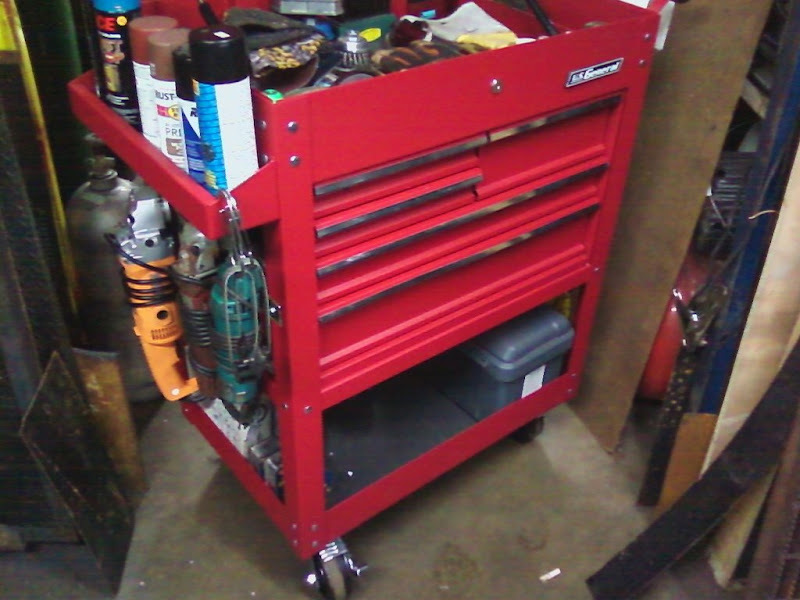 I think if I had a perfect world I would have several of these carts for the weld, wood, and just the Misc B.S. stuff and keep a large roll around for the mechanic type and specialty tools. It is a complete and total joy to walk to my cart and know on the way over there which drawer I need to get in. The only down fall I experienced is I leave the lid up, and last night I had one of those brain moments and left the O/A bottles turned on since they are behind the cart so I didn't look at them on the way out. At least when I remembered and came home at noon the house was still standing. The Acetylene bottle has a small leak in the valve, and I lost about half my gas. The bottle goes back to Air Gas Monday after work. It was a bad situation but a good lesson learned. Tonight I printed a sign to hang on the shop door, (O/A Bottles need to be OFF) . That should help me remember. I hope. I agree, sometimes buying makes sense especially considering the amount of work, even comes painted.